Personal income decreased 3.6 percent in January after increasing 2.6 percent in December, reflecting accelerated bonus payments and dividend distributions in December in anticipation of income tax rate changes. Current-dollar disposable personal income (DPI), after-tax income, decreased 4.0 percent in January after increasing 2.7 percent in December. Personal income fell in January by the most in twenty years, but this is no big surprise. Back in December 1992, personal income jumped 3.4% in anticipation of higher tax rates under President Clinton. There was a huge payback the following month as personal income fell 3.7%. The same thing happened in the last two reports. In anticipation of higher tax rates on both regular income and dividends, personal income surged 2.6% in December and then dropped 3.6% in January. In particular, dividends surged 33% in December and then dropped 35% in January. Private wages and salaries declined 0.8% in January after surging 0.9% in December, as some firms paid normal January bonuses one month early. 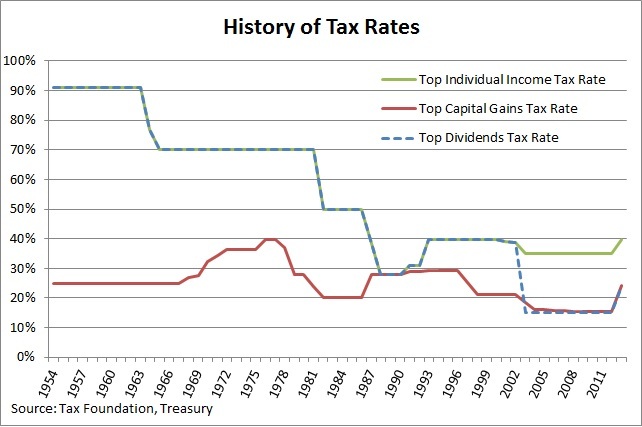 For more on how capital gains tax increases fail to raise additional tax revenue, see our recent report.